Happy Comic Release Day! Welcome to another installment of GeekMom Comic Book Corner, where we recap our adventures in comics for the week. 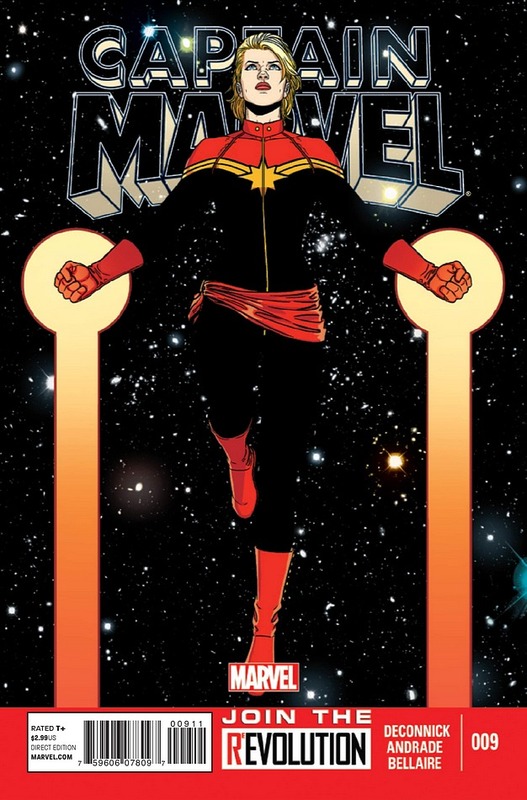 This week we look at The 10th Muse, Captain Marvel #9 and Coraline . I stumbled on The 10th Muse (written by Marv Wolfman and art by Ken Lashley) last Wednesday when I was looking for a new read. The main character on the front was beautifully drawn, and I figured if the story looked half as good it would be worth it. The story starts as we see Emma, Brent, and Dawn, friends who are pretty the Three Musketeers. They do everything together. Take the same classes. Live in the same apartment. Go towards the same goals. But during a post-college graduation trip to Greece, Emma gets hurt while climbing down a mountain. After that, everything changes… slowly. Eight years later, Emma returns with no answers as to where she’s been. She has hardly any recollection about what happened after Greece, but one things for sure: she’s a different woman when the situation calls for it. 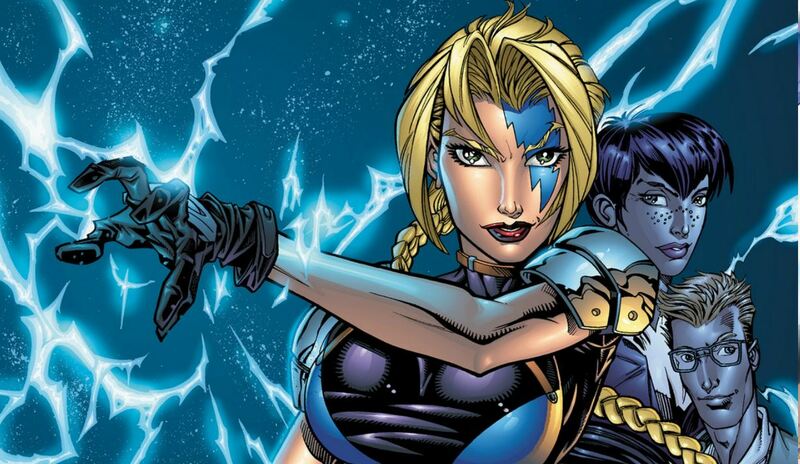 We see her in various scenarios where she is either Emma or a super-heroine, known as the 10th Muse. I’m not 100% sure yet that she realizes she is making the transformation from one to the other. In some scenes it appears that she knows, while in others she doesn’t seem all that sure about what’s going on. The main villain is Grayson Bishop, a man who gets what he wants the first time he asks for it from you, or else you risk getting cooked (literally). In some life or another, he shared a connection with Emma that she can’t remember. Regardless if she remembers or not, Bishop is determined that she will be his wife. After the first few pages of Vol. 1 I was hooked. One things for sure though, if I ever get a chance to meet Marv Wolfman, he’s getting a high five from me for the Star Wars references (best comedy relief I’ve read in a long time). Reading Vol. 1 didn’t explain much about who she is or how she manages to transform into the 10th Muse, so I’m excited to read on to Vol. 2, to see if it answers my questions. The 10th Muse is available on Comixology and is up for pre-order on Amazon. Corrina– Captain Marvel #9 by Kelly Sue DeConnick and Filipe Andrade. I hereby submit that every comic featuring a hero punching a dinosaur increases the fun factor by at least 50 percent. But fighting dinosaurs is just part of a busy day for Carol Danvers, Captain Marvel, which begins with Tony Stark waking her up and telling her he’s hacked her computer and re-arranged her schedule. Her day includes taking her cat to the vet (it does not go as planned but a civilian helps her out), meeting on a business venture (it gets a bit violent), and various stops along the way. At the end, it’s clear Carol stacked the day because she was afraid of bad news at the end, and she gets it but takes it the only way a superhero used to fighting dinosaurs and giant robots can. If you’re not reading Captain Marvel, you’re missing out. #9 is a great jumping on point not just because it’s mostly a one-and-done issue but because it gives a terrific glimpse of who and what Carol is. Word is that the title is lagging in sales, which is likely due to her not being a “name” hero and perhaps being a female hero. I’d encourage everyone to buy it while you can, either from your local comic shop or Comixology. If you’re anything like me, you have a list longer than Santa’s of books you really want to read but just haven’t quite found the time for yet. Neil Gaiman’s Coraline had been on mine for several years, but somehow it had never managed to climb to the top, nor had I found time to watch the film. A few weeks ago I spotted the graphic novel version in my local library–graphic novels are great in that they can be read much faster than the “full” version of the same tale–so I grabbed it and polished off the entire book off in around an hour. This straight adaptation uses chunks of Gaiman’s original text without much alteration, which some consider a let down as the text doesn’t flow as smoothly in the new format. I don’t read the format as often as many people do, so I failed to notice a problem, but fans of the comic/graphic novel genre have complained that the story needed re-working in order to better suit the medium. Coraline is illustrated by P.Craig Russell who has worked on Sandman and also adapted Wagner’s The Ring of the Nibelung as a graphic novel for Dark Horse; his current work includes part one of the forthcoming graphic novel adaptation of Gaiman’s The Graveyard Book . The illustrations certainly maintain the otherworldly creepiness of Sandman along with the series’ distinctive visual style of grotesque horror, which increases as the story builds toward its climax. As a newbie to the story, but not to Gaiman’s work, I really enjoyed this version of Coraline . 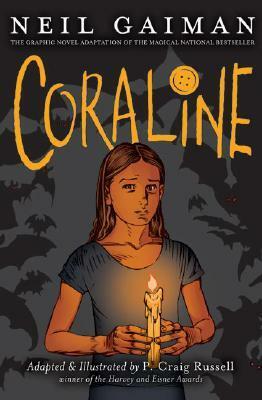 I can certainly appreciate many of the criticisms it has received in reviews–for one Coraline herself appears far older than her nine years–but without having built up my own visions and expectations for the story it was hard to be disappointed. I still intend to read the complete novel of Coraline, but for now the graphic novel has done more than enough to satisfy my curiosity.